At the end of last year, the comedy series in the genre slapstick comedy – MASKI SHOW – turned 25 years old! The celebration of this significant date comic-troupe "Masks" in partnership with the company AFL Productions decided to hold in the style of the most modern trends and technologies – by launching their own application in VR. Now 8 series are available for fans to download, built on the sketches of the comic troupe, 2 of which will be presented absolutely free. 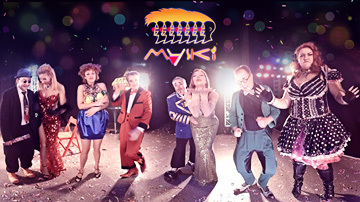 Successfully continuing tours around the world, creating a new range of "live performances" and developing as a clownery theater, in 1991 the comic troupe "Maski" opens another source of creative energy and starts producing television comedy films in the style of "silent cinema" titled "Maski-show." This series very quickly began to win the love of viewers not only in CIS countries, but also far abroad. Today, there are about eighty films of the series in the group's coin box, many of which have various prestigious national and international awards. Post-production design was carried out by CHINGIS company, for which an ambitious task was set – to create 360 stereotypes at the level of the Circus of the Sun. In many ways, the project was an experiment, and we are happy to say that it was a success. The shooting took place on a rig, consisting of 18 separate chambers. Due to this, the footage material was obtained for each eye with a resolution of about 9000 horizontally. Several solutions for high-quality cross-linking were tested, and, in the end, we got the desired result – despite the constant movement of actors between the cameras, the picture looks like a single one.